Connecticut has the worst-funded pension system in the country, maintaining its position from last year at the bottom of the list even as state pension payments continue to increase. The American Legislative Exchange Council released its annual study on state pension systems across country on Wednesday offering different measurements of state pension funding, none of which bode well for Connecticut. The study comes on the heels of famed investor Warren Buffet’s warning to businesses to avoid states facing significant pension problems. Connecticut’s unfunded pension liability amounts to $32,805 per person in the state and 45.13 percent of Connecticut’s gross state product, according to ALEC’s report. But Connecticut’s total funding ratio was dead last, with ALEC calculating the state has only 20.28 percent of the money necessary to keep its future promises to state employees and teachers. ALEC’s calculations differ from the state’s numbers because they use a lower assumed rate of return for pension investments, known as a “discount rate.” The lowered assumptions are considered a “safe” future projection. Connecticut assigns a 6.9 percent assumed rate of return to its State Employee Retirement System and an 8 percent rate of return for its Teachers Retirement System, the state’s two pension systems that account for the most state spending. Gov. Dannel Malloy and State Employee Retirement Board agreed to lower the SERS rate of return to 6.9 percent from 8 percent in 2017, which increased the unfunded ratio. The more realistic rate of return was coupled with an extension of the state’s payment period to 2046 to avoid a spike in pension costs. Nevertheless, SERS payments are expected to grow from $1.8 billion this year to $2.2 billion in 2022. Pension payments are part of Connecticut’s growing “fixed costs,” which are driving budget deficits. Notably worse-off, the teachers’ pension system still assumes an 8 percent return. The Center for Retirement Studies at Boston College warned that failure to meet that rate could drive the cost of those pensions to an unsupportable $6 billion per year. Former State Treasurer Denise Nappier recommended lowering the TRS discount rate to 6.9 percent and offered her office’s opinion that costs were more likely to rise to $3 billion per year by 2032. Although, teacher pensions are set in statute, changes can be politically difficult for lawmakers. A number of solutions have been proposed by Gov. Ned Lamont and others, which include shifting part of the pension costs on to municipalities and dedicating lottery revenue to the teachers’ pension fund. State employee retirements, however, are set through collective bargaining and the current benefits contract does not expire until 2027, meaning any changes to state employees’ retirement benefits will have to be negotiated with state employee union leaders, who have already indicated an unwillingness to make any changes to the over-arching SEBAC agreement. Lamont proposed adjusting state retirees’ annual cost of living adjustments to save $141 million by year 2021, but so far there are no indications the governor has been negotiating these changes with union leaders. According to ALEC’s report, Wisconsin had the best-funded pension system in the country, with 60 percent of its liabilities funded. 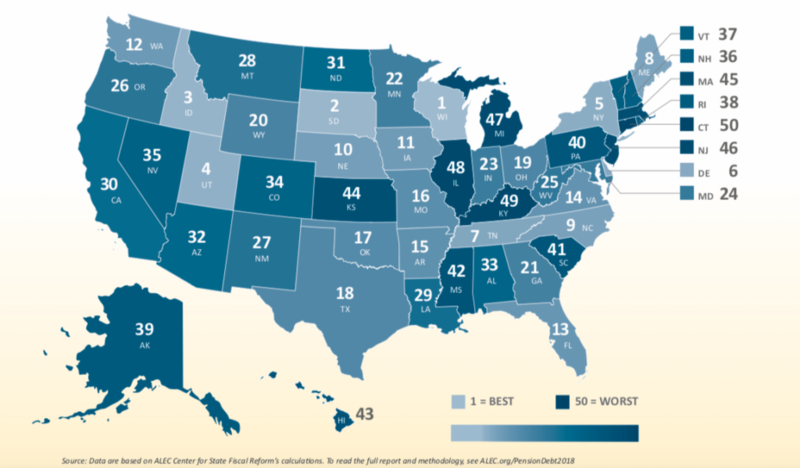 The total pension liability across all 50 states was estimated at 5.96 trillion, according to ALEC’s study. Clawbacks are in order and inevitable. It’s unreasonable and unjust to bankrupt 3.5 million residents for the sake of 100,000 state employees and retirees. A large part of the problem with the unfunded liabilities is that pensions can be started at an unrealistically young age after 20 years of service. This should be adjusted to a system similar to private plans where you need to be at least 65 to collect. Teachers also, in general, contribute less to the plan than those in other states. Certainly one major point has been the substandard rate of return on the fund itself. Last I saw it was about 4% over the last 10 years. That shows how unrealistic the 8% assumptions are. The result of this is the benefits look great but in reality, by keeping the 8% or for that matter 6.9% is just a way to avoid paying for them and waiting for the future implosion. The management under Napier has been incompetent and needs to be reformed. There also should be more transparency about the specifics of the investments and the manager’s results. Has there been favoritism in the assigned underperformers retention? Open it for everyone to see.